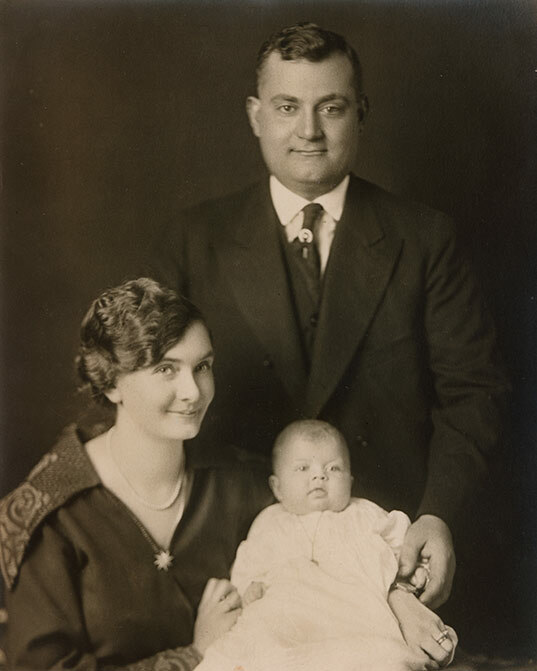 Black and white portrait of James Franceschini with his wife Annie and daughter Myrtle, Toronto, ON, ca. 1921. Myrtle was born in 1921. Given she is pictured as a baby, this photograph was likely taken soon after her birth. This is further supported by her attire, which suggest this was a formal portrait to commemorate her baptism. Unlike most Italian Canadians at the time, Franceschini was a protestant. This photograph was taken at the same time as another in our collection DICEA2011.0013.0008.